The remains of the residence of Beryl McBurnie, the “mother of Caribbean dance”, St. James, Trinidad. Photo by Rubadiri Victor, used with permission. A portion of Trinidad and Tobago's artistic community is up in arms about the demolition of Beryl McBurnie ‘s house, a property that was shortlisted by the National Trust  — the organisation charged with safeguarding the country's heritage sites — to be considered for protected status. The house was bulldozed to the ground on September 16. Affectionately called by her stage name, “La Belle Rosette” , McBurnie, who died in 2000, was one of the pioneers of Caribbean dance and the founder of The Little Carib Theatre , which she used to promote the arts and culture of both Trinidad and Tobago and the wider Caribbean region. While The Little Carib Theatre is widely recognised as McBurnie's legacy, the razing of her home has left a bitter taste in the mouths of many netizens accustomed to seeing historically significant landmarks in the state destroyed. Nearly two years ago, Greyfriar's Presbyterian Church  in Port of Spain was demolished by the site's new owner. They bulldozed to the ground the home of Beryl Mc Bernie […] the Mother of Caribbean Dance, the co-creator of Best Village, the preserver of our Folk traditions, the first choreographer of our Independence Festival, the founder of the Little Carib Theatre, the godmother of literally thousands of performers, companies, and performances here and in the diaspora. Her house. They bulldozed it. With things in it. We cannot be serious as a people. Cannot. We must confess now that the whole Independence thing, the flag, the anthem, everything, was just a big joke. A flam ting [a local term for ‘show off’] and we’re ready to move on now to Mc Donald’s, the Union Jack, Trump, the Star Spangled, whatever Reality Show boat-ride that comes along. Anything! But this Civilisation called Trinidad and Tobagp [sic]? We flunking dat exam. Cause we aint serious as big people, as Independent people, as heirs to one of the richest cultural traditions on planet Earth. WE CANNOT BE SERIOUS!!! Of course the contempt didn’t begin today. The house lay abandoned and overgrown for years whilst billions of dollars were being spent on fireworks, champagne, and box-drains… […] Upon her death the lack of any active Heritage legislation and the possession of completely zero National Cultural Policy or National Heroes Policy (which would have had protocols for the treatment of the homes and Legacy items of National Heroes) meant that everything she left behind was ripe for ruin. You know what? This place deserves to die a painful death. […] No respect for a woman who basically created T&T dance culture? This is a new level of disgusting in a landscape that has far too many examples of disgusting. 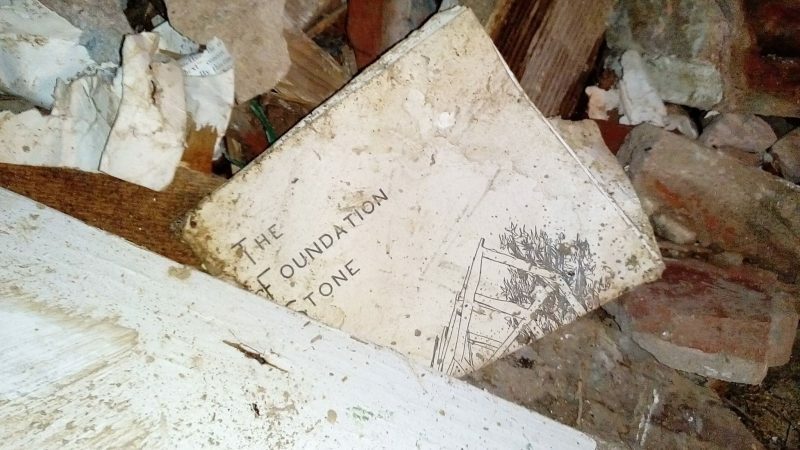 “The Foundation Stone” — part of the debris left behind at McBurnie's demolished residence. Photo by Rubadiri Victor, used with permission. In reality, McBurnie's legacy has not been disregarded; it is being looked after by the board of The Little Carib Theatre, and any items of worth or cultural significance were removed  from her residence years ago. The theatre space is in operation and has been recently renovated, but it is no secret that fundraising for the arts in Trinidad and Tobago can be an uphill battle. Thus, the board took the decision to sell McBurnie's residence, reportedly to fund more pressing projects. According to the property's new owner Dexter John, who organised the demolition, the house had been listed for sale  a while ago. While he understands that the artistic community may be upset over the action, he told  the TV6 News that any blame lies with the board of the Little Carib. There's lots of outrage over the demolition of Beryl McBurnie's home on Panka St, St James. But what's the point of outrage now if you didn't actually give any thought to the deterioration of this historical building over the years? How many people actually listened to and supported those who pushed the cause? People talk about what ‘the government’ doing and they're right but more importantly what are we doing to help preserve our treasures? 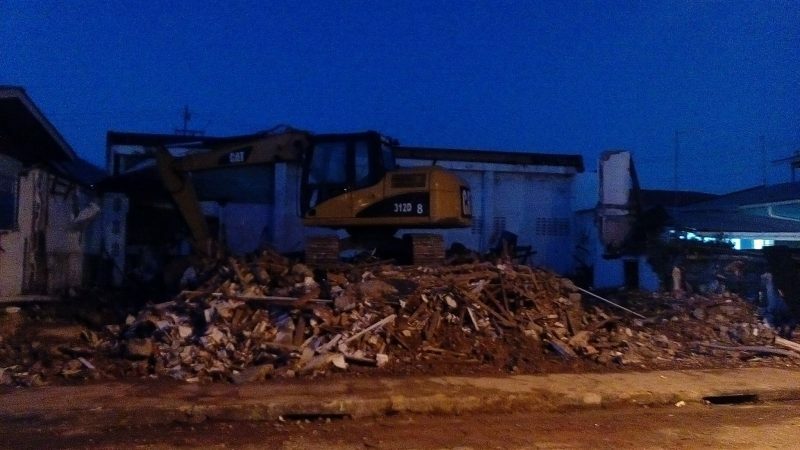 On Twitter, netizens shared their disappointment at the loss of the home. I remember cleaning Ms Beryl McBurnie's house as a little boy going to St. Agnes Primary School. Sad to see the house demolished. I sure Beryl McBurnie rolling her in grave at that stupidness that went on. While she was saddened at the news of the demolition, and suggested that the site could still be acknowledged as her home — via a plaque of some sort, for instance — she noted that even casual observation showed serious structural issues and that the building itself, though eclectic, had no real architectural merit. 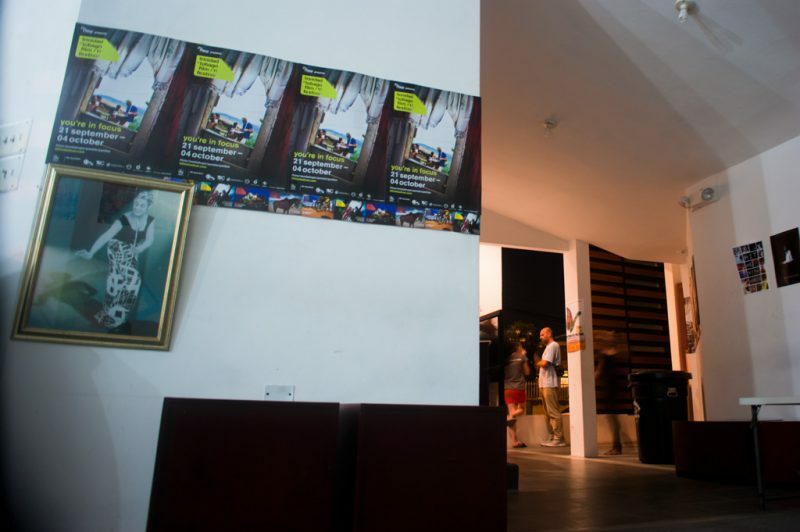 The lobby of The Little Carib Theatre, where a framed portrait of Mc Burnie hangs on the wall. Photo by the trinidad+tobago film festival, used with permission. While experts and laypeople alike continue to debate the architectural and heritage merits of McBurnie's now-destroyed home, some good may yet come out of the episode. Whether the public will rally behind Victor's initiative remains to be seen.